This is delicious -so simple yet tasty. And vegan. I think it's possibly even better served cold. This was the perfect accompaniment to sausages. I served it with homemade mustards, one hot, one sweet, radishes, goat gouda from Holland, and some great artisan rye bread. Mr. Nightshade declared this a keeper. He's ready to serve it with grilled pork chops. I came across this recipe on a blog, although it's actually in a book I have. I happened to have all the ingredients and it was a rather chilly Sunday evening, so I decided to try it. It doesn't sound very exciting, but it's surprisingly good -- I'd make it again. A typically brief ED recipe: five sentences, and instructions about as explicit as a GBBO technical challenge. I recognised it as almost identical to the classic recipe for tarte aux myrtilles, so I adapted it slightly in ways I thought would improve it. She doesn't tell you to blind-bake the pastry, but it seemed to me a recipe for soggy bottoms not to, so I did. Then I sprinkled a thin layer of blended ground almonds, flour, and sugar over it to absorb juice, before adding the cherries. "Bake" is the final instruction, not specifying for how long or what temperature. It took a surprisingly long time for the cherries to soften, and I ended up baking it for about 45 minutes at 170C. The cherries didn't leak nearly as much juice as I expected, and although it tastes good it doesn't look that attractive. It would be greatly improved by glazing it with sieved cherry jam after removing it from the oven. I think it could also have done with more than the teacupful of cream she suggests. Here, together in one volume, are three culinary classics (Mediterranean Food, French Country Cooking, and Summer Cooking) from England's most famous food writer, who has inspired and influenced a whole generation of cooks. Elizabeth David, as James Beard points out in his forward, was a leader, ahead of her time who shook her readers out of their culinary rut, challenging them to explore a different world of food. Today, some of the foods she introduced to the English-speaking world have become household words, like gazpacho and pesto, but Mrs. David was the first to discover these treasures, and her recipes are still the best. Mrs David lived in France, Italy, Greece and Egypt, learning to master the local dishes, obtaining all her information firsthand. She had an unerring palate, an instinct for everything rational, wholesome, and genuine in cooking, and a gift for evoking the color, the lore, and magic not only of the sun-drenched Mediterranean but also of the lovely, honest dishes of her own country. Here are hundreds of marvelous recipes and ideas for preparing simple foods in exciting ways. 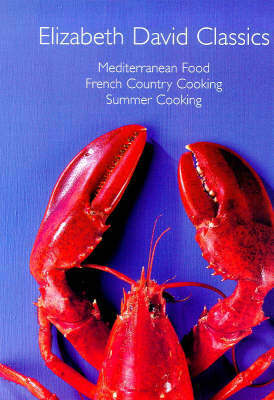 Mediterranean Food, French Country Cooking and Summer Food are permeated with Elizabeth David's wonderful authority, her sense of being there, her way of taking the reader into her confidence rather than spelling everything out, of sharing delightful tidbits about Gertrude Stein, Julius Caesar, or fellow travelers. As Mr. Beard also wrote, Elizabeth David had the rare gift of stimulating the imagination in both the mind and the mouth and making you want to head straight for the kitchen. More than two million copies of Mrs David's books have been sold. She won the Glenfiddich Writer of the Year Award for English Bread and Yeast Cookery, in 1977, was named Chevalier of the French Ordre du Merite Agricole in 1977, made an honorary doctor of the University of Essex in 1979, elected Fellow of the Royal Society of Literature in 1982, Awarded the Commander of the Order of the British Empire in 1986, and inducted into the James Beard Hall of Fame in 1995. Born December 26, 1913, she died in London, May 22, 1992.